I think I just discovered a way for you to eat candy corn for breakfast. You’re probably not the kind of person who spends your time trying to justify candy corn for breakfast, are you? Well, I am. And with just a few days to go until Halloween, I’m going to fit candy corn into my diet any way I can. You’re either with me or you’re against me… I recommend joining! As I’ve mentioned only about 94034 times on this blog before, I am not a fan of most aspects of Halloween. It’s the idea of grown adults dressing in costumes that mildly creeps me out. That said, I begrudgingly participate. Mainly because my friends have awesome Halloween parties and because I don’t want to be an outcast at work. This year is a little bit more fun since I have a dog I get to dress up in ridiculous costumes. But otherwise, I’m just in it for the candy. 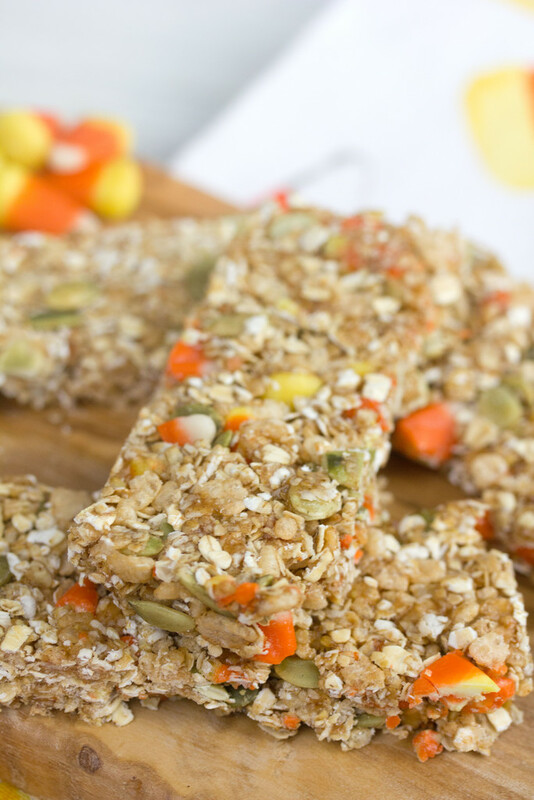 For the most part, these granola bars are fairly healthy and a great way to start the day. I say “for the most part” because obviously there is some sugar involved… Some of that in the form of candy corn. But this is the time of year you’re allowed to do it, so take advantage. 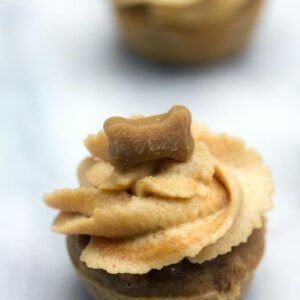 They’re also ridiculously easy to make. You legit just mix some oats, pumpkin seeds, and Rice Krispies together and bring butter, sugar, honey, and cinnamon to a boil. 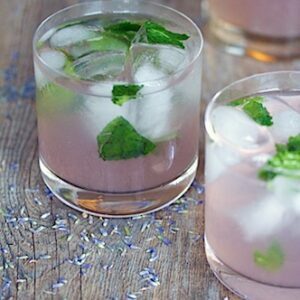 Mix everything together, pour into a pan, and let chill. Slice into bars and enjoy. For breakfast… Or an afternoon “I need some energy!” snack. Which is pretty much every day for me. It’s also just about every day that I crave candy. 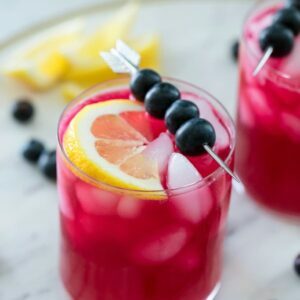 To be honest, I’m trying to cut down on my sugar intake a bit… But I don’t really feel like that’s appropriate to talk about in this post. Also, I’m well aware this is not going to happen until Halloween is over. In the meantime, let’s eat way too much candy corn until we feel so sick that we swear it off forever. Or at least for 24 hours. You could say that these granola bars help you practice portion control. They aren’t fully loaded with candy corn; just enough to keep you satisfied without overdoing it. 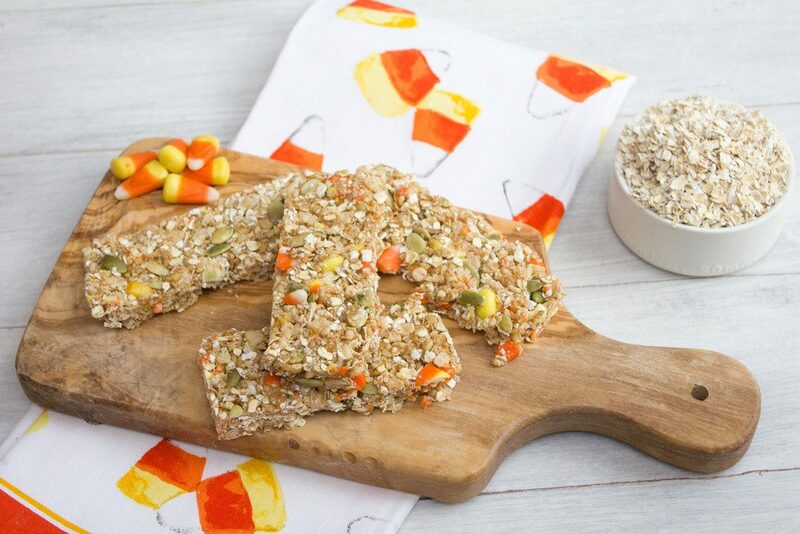 These are also fun treats to make with your (or your kids’) leftover Halloween candy. 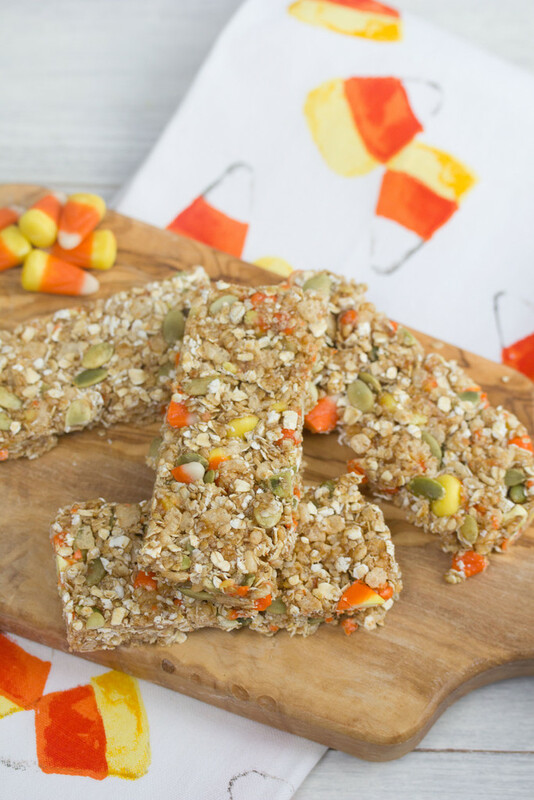 Instead of keeping loads of candy corn sitting around, wrap it up into a snack that contains a little bit of nutrition, too. Or just yell at me that I’m “wasting” perfectly good Halloween candy by mixing it up with the likes of oats. I’ll respectfully disagree while I envision developing a recipe for a big bowl of candy corn oatmeal. Maybe next year? How do you feel about candy corn? We are big on it in my household… My husband is obsessed! 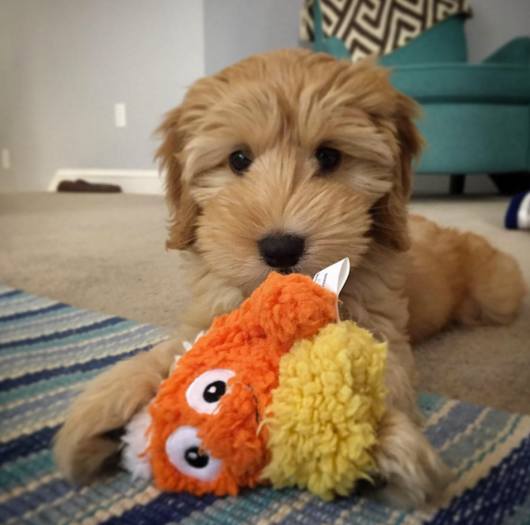 And believe it or not, our puppy’s very favorite toy is this little candy corn! We think it’s hilarious and realize it’s going to have to stick around long after Halloween is over. She has a million toys and always chooses this one! Leftover Halloween candy? Or just a love for candy corn? 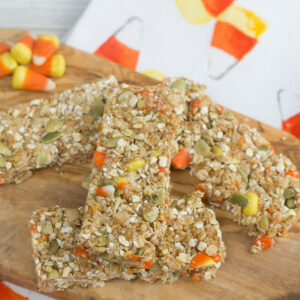 Either way, these Autumn Candy Corn Granola Bars are the perfect easy-to-make sweet snack. No baking required! Line a 9x9baking pan with foil and lightly grease. 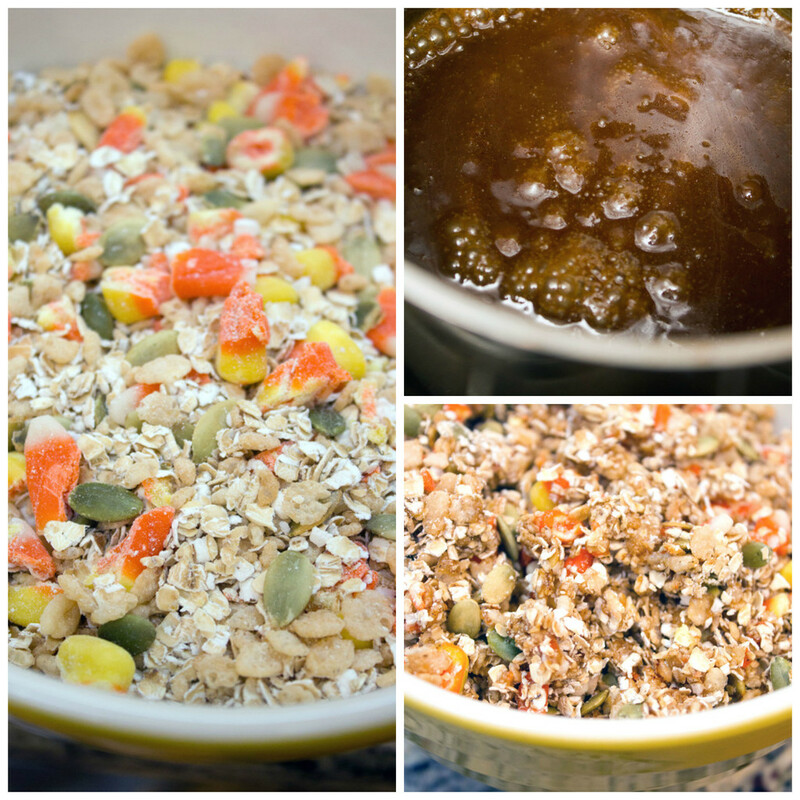 In a large bowl, mix together quick cooking oats, puffed rice cereal, pumpkin seeds, and chopped candy corn. In a small saucepan over medium-high heat, stir together butter, brown sugar, honey, and cinnamon. Let mixture come to a boil, then lower heat and let simmer for about 2 minutes. Pour liquid mixture over dry ingredients and stir well to coat well. Press mixture evenly into the prepared pan. 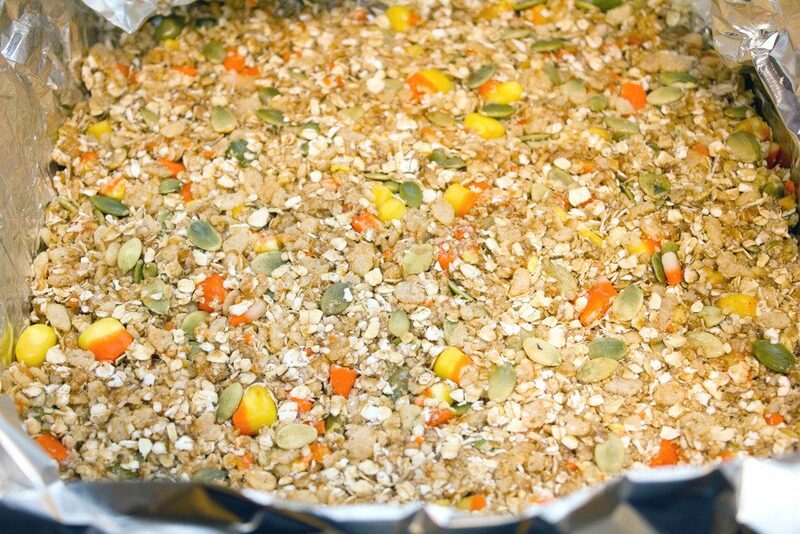 Place pan in refrigerator for at least 30 minutes to allow granola bars to cool and harden. Remove to cutting board and cut into 12 pieces. 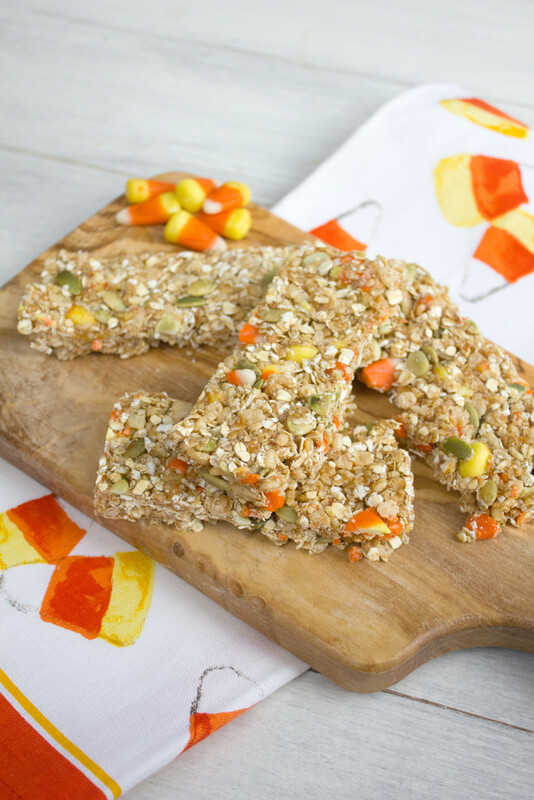 10 Responses to "Autumn Candy Corn Granola Bars"
These granola bars are so fun and festive! 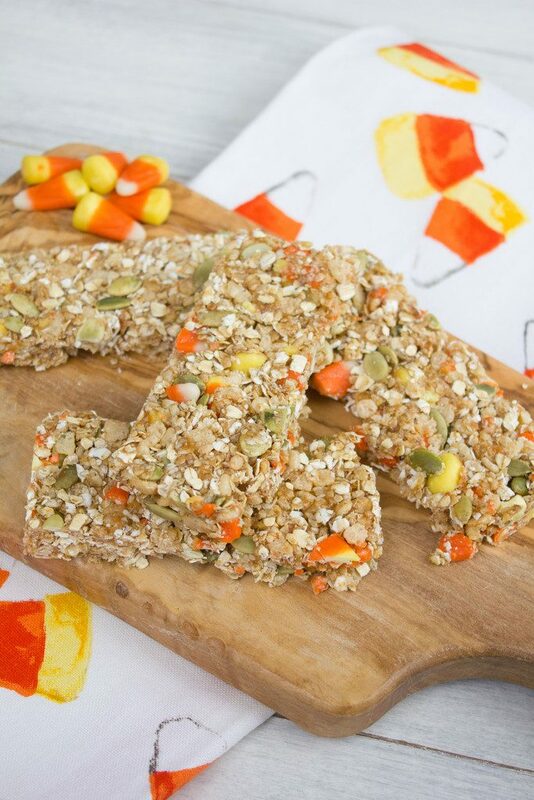 I love the pumpkin seeds and candy corn – perfect for fall! These bars are so creative, Sues! Love the use of candy corn in here. 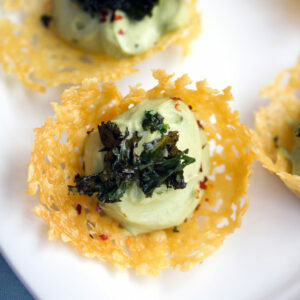 Sounds like the perfect snack to munch on! I think these are my new favorite “breakfast” snack. Not sure if I should be eating these for breakfast, but whatever. Nom nom nom! How fun and festive! My kids would love them. 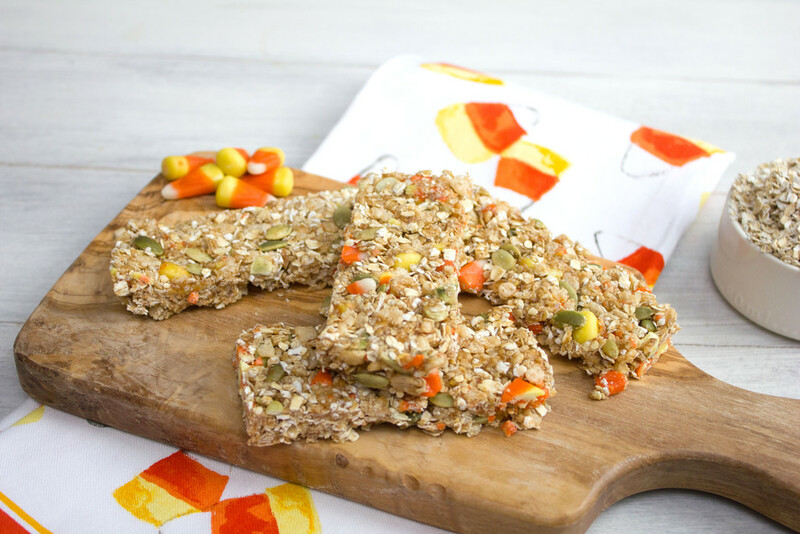 You are my favorite for finding a way to incorporate candy corn into breakfast. These are genius!! We love the pumpkin-shaped candy corn thingies this time of year (I realize that’s super specific….). These are so cool! What a lovely snack bar – I just need to get my hands on some candy corn. Candy Corn is too sweet for me – it hurts my teeth! that said, i could probably enjoy these because the oats would balance them out!